The Tab has landed - the Samsung P1000 Galaxy Tab tablet just went official, confirming many of its rumored specs. The 7" tablet has full voice call functionality, up to 7 hours of video playback, DivX and Flash videos included and the excellent Android web browser that has plenty of room to stretch its legs on the WSVGA screen. 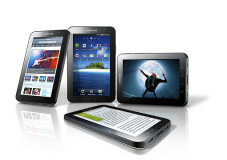 The Samsung Galaxy Tab is centered around a 7" TFT screen with 1024x600 pixels resolution, driven by a Cortex-A8 processor running at 1GHz, 512MB RAM and PowerVR SGX540 graphics. The OS running the show is Android 2.2 Froyo, of course, but without the TouchWiz skin. Samsung have concentrated on providing and excellent app package instead. The Tab has GSM/GPRS/EDGE along with HSPA-enhanced 3G connectivity. Both for voice and data, SMS and MMS too. It even has a front-facing 1.3MP camera for video calls. On the back, there's a second camera - a 3MP auto-focus snapper with LED flash. The Samsung P1000 Galaxy Tab is big for a phone but compact for a 7" tablet, it measures 190.1 x 120.5 x 11.98mm and weighs 380g. The reduced weight compared to the iPad is in part due to the smaller size and because the Tab has a plastic body. There are two options for the built-in memory - 16GB or 32GB, which is expandable using microSD cards up to 32GB. 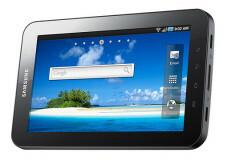 The connectivity of the Samsung Galaxy Tab is rounded off by Bluetooth 3.0, Wi-Fi b/g/n and an Apple-like 30 pin data connector. And an HDMI will come in handy - the extensive video codec support (DivX, XviD, H.264, Flash 10.1 too) and the 4000 mAh battery that has enough juice for up to 7 hours of movies. The tab handles HD resolutions with ease too. Samsung have added the Readers Hub, which boasts access to 2 million books and thousands of magazines and newspapers, joining on the tablet assault on eReaders. If the apps that come preloaded on the Samsung P1000 Galaxy Tab aren't enough, you have full access to the Android market. We're not sure whether most apps there would be fit for the Tab's 1024x600 pixel resolution. The Samsung Galaxy Tab will launch in Europe in mid-September (Italy first) and expand to the US, Asia and Korea in the months to follow. is this tab supporting camera zooming manually?